I get asked a lot to describe my studio. I think there’s a prevailing notion that artists’ studios are terribly glamorous, filled with all kinds of funky vintage furniture and antique desks…ha. Unless vintage and antique are code for “second-hand”! It is true, though, that the Wigalo Block (if you’ve lived in Calgary a long time, you might remember the old Beltline restaurant Cannery Row…that building) does have the right vibe. You either have to climb 5 flights of stairs — yay, fitness — or take the manual-drive freight elevator, complete with graffiti inside the shaft, which you get to see through the wire door. Cheerfully admit the elevator intimidated me, just a little, when I first moved in. But you get used to it. Once you get up there to 5E, I’m the first door on the right. My space has an oddly uneven floor, which, it turns out, is because 5E was originally a warehouse. Most of the floor is soft pine (very worn, covered with a hunk of vinyl over the worst bit, just so I can keep it clean) but there’s a strip of really lovely hardwood which was, apparently, the track for the heavy warehouse carts to travel along. I keep my easel on there. I stopped tripping over the edge not too long after I moved in, but it still catches unwary visitors. The rest of my furniture is pretty functional — some el cheapo dressers for storage, my drafting table from when I first went to art school, the old kitchen table I bought for $30 many many moons ago, wooden chairs from hubby’s aunt’s garage. So, yep, I do have a funky vintage armchair. There it is. Don’t they say cliches get that way for a reason? This entry was posted in musings from the studio on November 22, 2010 by Frances. Your studio is quite roomy. Nice to have a window and a funky arm chair. I liked those sketches you did in the mountains. Hope you don’t lose your love of that scenery and capture some of those images again in your recent works. Oh, I haven’t lost my love of the scenery! but I don’t seem to be able to use images that aren’t relevant to my current situation. The boy will grow and there will be mountains again…. 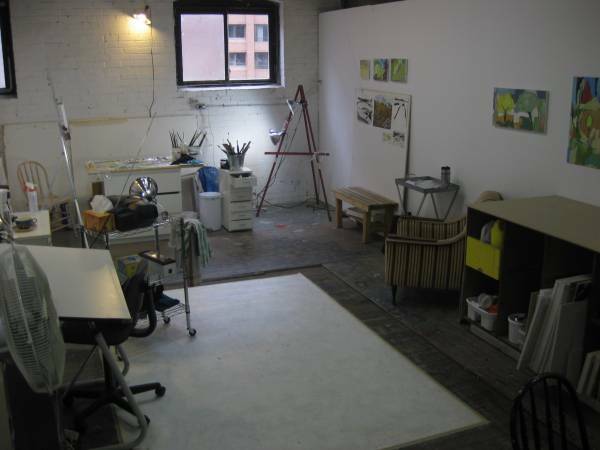 Very envious of your lovely studio space! It’s perfect. Loving your work by the way and thanks for the follow and the chance to find you and more of your work here.